Dropbox expires passwords periodically as a proactive security measure. 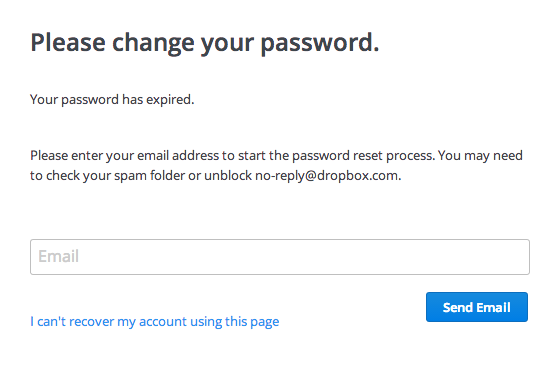 If your password has expired, you’ll need to update it before you can access your Dropbox account again. You’ll also need to update your password before linking a new computer, phone, tablet, or API app. Open dropbox.com in your web browser. Try to sign in with your expired password. When you see the message above, enter the email address associated with your Dropbox account. If you don’t see the message above, you can go directly to the password update page. You should receive an email with a link to change your password. Click the link in this email, and follow the prompts to reset your password. If you initiate a password update but don't receive the follow-up email, check the spam folder of your inbox. If the email isn't there, add no-reply@dropbox.com to your address book and then update your password again. Here’s what to do if you’ve lost access to your email account. What else can I do to keep my Dropbox account secure? For more resources on how to keep your accounts secure, please visit our security and privacy page.